Oh, where to begin. I should probably tell you guys about the fact that I had been anticipating this book ever since I read Leslye’s first book, Ava Lavender, three years ago. I loved it so much: the writing, the story, the characters, the magical realism. Of course I would be excited for Leslye’s new book! (Ava Lavender was, and still is, one of my favorite books to this day). Sadly, despite this being a good book, to me, it did not live up nearly to the wonderfulness that is The Strange and Beautiful Sorrows of Ava Lavender. Don’t get me wrong–it certainly wasn’t bad. It was a good book (hence the 3.5 stars). But my expectations were too high, and they weren’t met; which means I am now currently pretty disappointed. This will be spoiler-free. Unlike Ava Lavender, I’d say this book is basically urban fantasy. Magical realism has something different about it–it’s more subtle, less public, and it’s accepted and not questioned but people do recognize the fact that there is something different. This book, as I was saying, I felt like tried to have magical realism, but it didn’t work. The fantastical scenes were too intense, and the atmosphere of the book wasn’t working well with me. Perhaps the most disappointing part of this novel for me was the fact that the beautiful writing in Ava Lavender did not seem to show up. Leslye’s writing is still good, but it didn’t blow me away. I didn’t feel the atmosphere of the novel; I didn’t feel enchanted or captured by the words (which is what I had been expecting). 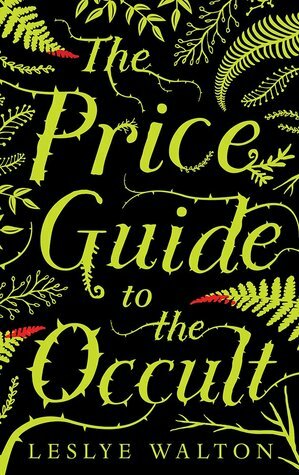 Regardless, I still enjoyed reading The Price Guide to the Occult. It was still intriguing, and I wanted to get to the end. It just didn’t hook me as I had expected it to, and I didn’t end up loving the characters or feeling much attachment to them. Personally, I thought Leslye’s writing shone the most when she wrote about the past (i.e. ; Rona and her descendants) rather than Nor, maybe because it reminded me of Ava Lavender. It ended with a hook, though, so I am curious to see what will happen if there is a future novel because I think it will definitely be more interesting. Also: regarding the romance–I didn’t get the point. There was a half (?) love-triangle, but I thought Reed’s character was 100% useless. The book would have been much more interesting if the main love interest had been Gage, since Nor and Gage display much more tension than do Reed and Nor. Anyway, I really hope we get a second book because I think these issues may be resolved then, and maybe I’ll be satisfied once again :’).